The goal of this document is to walk you through the concepts and specifics that should be understood while contributing to OpenStack. Development on OpenStack requires at minimum an account on the OpenStack Gerrit Code Review System. Effective Development in OpenStack also requires interacting with other developers in IRC channels on Freenode. It is recommended to start by getting set up on IRC so that one can ask questions if one encounters issues with other phases of account setup. OpenStack uses the Freenode IRC network for real-time communication. If you do not know how to connect to Freenode, the Connecting to Freenode document will help. It is highly recommended to Register your IRC Nick. There are times when the OpenStack Project needs to configure our channels to only allow people to join who are using a Registered Nick. Registering a Nick also prevents someone else from taking a Nick that people come to know you by. For further information about the use of IRC in OpenStack, see IRC Guide. Prior to contributing to an OpenStack source code repository a few steps need to be completed. This document covers the steps that get you started, such as creating a few accounts on required websites, signing a contributor license agreement, uploading an ssh key, and installing git-review. You’ll need a Ubuntu One account, since this is how the Web interface for the Gerrit Code Review system will identify you. This is also useful for automatically crediting bug fixes to you on Launchpad when you address them with your code commits. Visit https://review.openstack.org/ and click the Sign In link at the top-right corner of the page. Log in with your Ubuntu One OpenID. The first time you sign into OpenStack’s Gerrit site, you will be prompted to “Select a unique username:”. You can enter your Ubuntu One username here, or something else if you want. Type carefully, as once set it cannot be changed. This is the username you will eventually use to submit changes to Gerrit and to perform authenticated queries through its API. Because the OpenStack community’s Gerrit deployment uses Ubuntu One OpenID single sign-on, you won’t need a separate password for Gerrit, and once you log in to any service relying on that OpenID provider such as Launchpad or a variety of OpenStack community systems (review, storyboard, wiki), you won’t have to enter your password for the others. Unless you are an U.S. Government Employee (see below), agree to the Individual Contributor License Agreement. The full text of the agreement will be displayed before you can enter “I AGREE” below it, but it’s also anonymously available if you want to preview the OpenStack ICLA now. Employees of the U.S. Government do not sign the Individual CLA. Instead, someone with authority to sign on behalf of your agency should sign the U.S. Government Contributor License Agreement. Please contact the OpenStack Foundation to initiate this process. If you are contributing on behalf of a company or organization, you still need to sign the ICLA above but someone at your company or organization also needs to sign the Corporate Contributor License Agreement providing a list of people authorized to commit code to OpenStack. If you need a printable copy of the Corporate CLA please email community managers. Check How to update the CCLA to provide changes to such list. A list of current companies and organizations with an existing Corporate CLA is available for your review. You’ll also want to upload an SSH key to Gerrit while you’re at it, so that you’ll be able to commit changes for review later. This is separate from adding a key to Launchpad (which you can do if you like, but is not required for contributing to OpenStack). You’ll want to make sure that the user.email you specify matches at least one you’ve provided to Gerrit. By default this is taken from your OpenID login the first time you authenticate, but you can also change it or add more addresses through the Contact Information page at any point in the future. We recommend using the git-review tool which is a git subcommand that handles all the details of working with Gerrit, the code review system used in OpenStack development. Before you start work, make sure you have git-review installed on your system. If you run into trouble, you can refer to the git-review documentation. 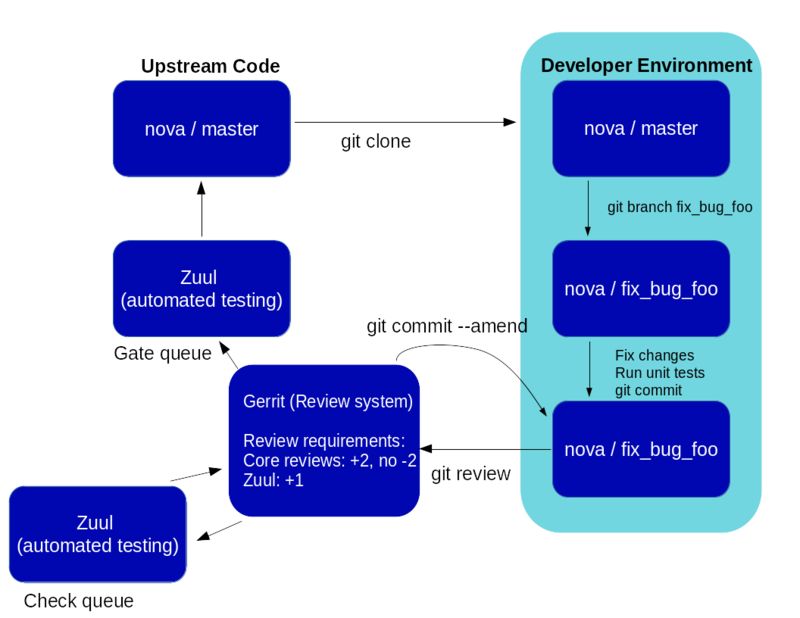 All of git-review’s interactions with Gerrit are sequences of normal git commands. If you want to know more about what it’s doing, just add -v to the options and it will print out all of the commands it’s running. If you haven’t already, you may want to join The OpenStack Foundation at this point. Among other privileges, this allows you to vote in official elections and run for elected positions within the OpenStack community. When signing up for Foundation Membership, make sure to include the email address you’ll use for code contributions in one of the fields in your profile, since this is how officials for technical elections will be able to identify you as an eligible voter or candidate. In order to qualify to participate in elections, your member level also needs to be Foundation Member (not Community Member) and you need to make sure you remember to keep your foundation membership email addresses up to date if you change the address you’re using; at least one address in your Gerrit account needs to match at least one address in your foundation member profile if you want to be able to participate in technical elections. To keep your membership active you must also regularly vote in elections for the OpenStack Foundation Board of Directors once you are able to do so; otherwise your membership will lapse after one year and you’ll need to rejoin before you can vote in any further official OpenStack elections of any kind. If you don’t remember your Gerrit user name go to the settings page on gerrit to check it out (it’s not your email address). We have a tutorial: Learn the Gerrit Workflow in the Sandbox. If this is your first time contributing to OpenStack, we strongly suggest you follow this tutorial. Bug reports for a project are generally tracked on Launchpad at https://bugs.launchpad.net/<projectname>, or on StoryBoard ( https://storyboard.openstack.org). Contributors may review these reports regularly when looking for work to complete. Confirm new bugs: When a bug is filed, it is set to the “New” status. A “New” bug can be marked “Confirmed” once it has been reproduced and is thus confirmed as genuine. Review incomplete bugs: See if information that caused them to be marked “Incomplete” has been provided, determine if more information is required and provide reminders to the bug reporter if they haven’t responded after 2-4 weeks. Review stale In Progress bugs: Work with assignee of bugs to determine if the bug is still being worked on, if not, unassign them and mark them back to Confirmed or Triaged. Mentioning the story will create a handy link to the story from gerrit, and link to the gerrit patch in StoryBoard. Mentioning the task will change the task status in StoryBoard to ‘review’ while the patch is in review, and then ‘merged’ once the patch is merged. When all tasks in a story are marked ‘merged’, the story will automatically change status from ‘active’ to ‘merged’. If the patch is abandoned, the task status will change back to ‘todo’. It’s currently best to note both story and task so that the task status will update and people will be able to find the related story. Also see the Including external references section of the OpenStack Git Commit Good Practices wiki page. Many OpenStack project teams have a <projectteam>-specs repository which is used to hold approved design specifications for additions and changes to the project team’s code repositories. You can typically find an example spec in specs/template.rst. Check the repository for the project team you’re working on for specifics about repository organization. Historically, Launchpad blueprints were used to track the implementation of these significant features and changes in OpenStack. For many project teams, these Launchpad blueprints are still used for tracking the current status of a specification. For more information, see the Blueprints wiki page. View all approved project team’s specifications at https://specs.openstack.org/. Once your local repository is set up as above, you must use the following workflow. Git commit messages should start with a short 50 character or less summary in a single paragraph. The following paragraph(s) should explain the change in more detail. Note that in most cases the Change-Id line should be automatically added by a Gerrit commit hook installed by git-review. If you already made the commit and the Change-Id was not added, do the Gerrit setup step and run: git commit --amend. The commit hook will automatically add the Change-Id when you finish amending the commit message, even if you don’t actually make any changes. Do not change the Change-Id when amending a change as that will confuse Gerrit. Do not check in changes on your master branch. Doing so will cause merge commits when you pull new upstream changes, and merge commits will not be accepted by Gerrit. When that completes, automated tests will run on your change and other developers will peer review it. It’s important to understand how Gerrit handles changes and patch sets. Gerrit combines the Change-Id in the commit message, the project, and the target branch to uniquely identify a change. A new patch set is determined by any modification in the commit hash. When a change is initially pushed up it only has one patch set. When an update is done for that change, git commit --amend will change the most current commit’s hash because it is essentially a new commit with the changes from the previous state combined with the new changes added. Since it has a new commit hash, once a git review is successfully processed, a new patch set appears in Gerrit. As long as you leave the “Change-Id” line in the commit message alone and continue to propose the change to the same target branch, Gerrit will continue to associate the new commit with the already existing change, so that reviewers are able to see how the change evolves in response to comments. Use the editor to squash any commits that should not appear in the public history. If you want one change to be submitted to Gerrit, you should only have one “pick” line at the end of this process. After completing this, you can prepare your public commit message(s) in your editor. You start with the commit message from the commit that you picked, and it should have a Change-Id line in the message. Be sure to leave that Change-Id line in place when editing. Once the commit history in your branch looks correct, run git review to submit your changes to Gerrit. git review rebases the existing change (the dependency) and the new commit if there is a conflict against the branch they are being proposed to. Typically this is desired behavior as merging cannot happen until these conflicts are resolved. If you don’t want to deal with new patchsets in the existing change immediately you can pass the -R option to git review in the last step above to prevent rebasing. This requires future rebasing to resolve conflicts. If the commit your work depends on is updated, and you need to get the latest patchset from the depended commit, you can do the following. The note for the previous example applies here as well. Typically you want the rebase behavior in git review. If you would rather postpone resolving merge conflicts you can use git review -R as the last step above. If your change has a dependency on a change outside of that repository, like a change for another repository or some manual setup, you have to ensure that the change merge at the right time. For a change depending on a manual setup, mark your change with the “Work in Progress” label until the manual setup is done. A core reviewer might also block an important change with a -2 so that it does not get merged accidentally before the manual setup is done. To use them, include “Depends-On: <gerrit-change-url>” in the footer of your commit message. Use the permalink of the change. This is output by Gerrit when running git-review on the change, or you can find it in the top-left corner of the Gerrit web interface. Where it says “Change ###### - Needs …” the number is the link to the change; you can copy and paste that URL. A patch can also depend on multiple changes as explained in Multiple Changes. These are one-way dependencies only – do not create a cycle. When Zuul sees CRD changes, it serializes them in the usual manner when enqueuing them into a pipeline. This means that if change A depends on B, then when they are added to the gate pipeline, B will appear first and A will follow. If tests for B fail, both B and A will be removed from the pipeline, and it will not be possible for A to merge until B does. Note that if changes with CRD do not share a change queue (such as the “integrated gate”), then Zuul is unable to enqueue them together, and the first will be required to merge before the second is enqueued. When changes are enqueued into the check pipeline, all of the related dependencies (both normal git-dependencies that come from parent commits as well as CRD changes) appear in a dependency graph, as in the gate pipeline. This means that even in the check pipeline, your change will be tested with its dependency. So changes that were previously unable to be fully tested until a related change landed in a different repo may now be tested together from the start. All of the changes are still independent (so you will note that the whole pipeline does not share a graph as in the gate pipeline), but for each change tested, all of its dependencies are visually connected to it, and they are used to construct the git references that Zuul uses when testing. When looking at this graph on the Zuul status page, you will note that the dependencies show up as grey dots, while the actual change tested shows up as red or green. This is to indicate that the grey changes are only there to establish dependencies. Even if one of the dependencies is also being tested, it will show up as a grey dot when used as a dependency, but separately and additionally will appear as its own red or green dot for its test. A Gerrit URL refers to a single change on a single branch, so if your change depends on multiple changes, or the same change on multiple branches of a project, you will need to explicitly list each URL. Simply add another “Depends-On:” line to the footer for each additional change. If a cycle is created by use of CRD, Zuul will abort its work very early. There will be no message in Gerrit and no changes that are part of the cycle will be enqueued into any pipeline. This is to protect Zuul from infinite loops. The developers hope that they can improve this to at least leave a message in Gerrit in the future. But in the meantime, please be cognizant of this and do not create dependency cycles with Depends-On lines. Changes for the CI infrastructure like changes openstack-infra/project-config are never tested in a production simulated environment. So, if one of the changes adjusts the job definitions or creates a new job, a Depends-On will not test the new definition, the CI infrastructure change needs to merge to master and be in production to be fully evaluated. If a test job installs packages from PyPI and not via source, be aware that the package from PyPI will always be used, a Depends-On will not cause a modified package to be used instead of installing from PyPI. As an example, if you are testing a change in python-novaclient that needs a change in python-keystoneclient, you add a Depends-On in the python-novaclient change. If a python-novaclient job installs python-keystoneclient from PyPI, the Depends-On will not have any effect since the PyPI version is used. If a python-novaclient job installs python-keystoneclient from source, the checked out source will have the change applied. Do not add a Depends-On an abandoned change, your change will never merge. If you backport a change to another branch, it will recieve a new URL. If you need to additionally depend on the backported change, you will need to amend the commit message to add another Depends-On footer. A change that is dependent on another can be approved before the dependent change merges. If the repositories share the gate queue, it will merge automatically after the dependent change merged. But if the repositories do not share the gate queue, it will not merge automatically when the dependent change has merged, even a recheck will not help. Zuul waits for a status change and does not see it. The change needs another approval or a toggle of the approval, toggle means removing the approval and readding it again. Log in to https://review.openstack.org/ to see proposed changes, and review them. To provide a review for a proposed change in the Gerrit UI, click on the Reply... button. In the code review, you can add a message, as well as a vote (+1,0,-1). It’s also possible to add comments to specific lines in the file, for giving context to the comment. For that look at the diff of changes done in the file (click the file name), and click on the line number for which you want to add the inline comment. After you add one or more inline comments, you still have to send the Review message (see above, with or without text and vote). Prior to sending the inline comments in a review comment the inline comments are stored as Drafts in your browser. Other reviewers can only see them after you have submitted them as a comment on the patchset. Any OpenStack developer may propose or comment on a change (including voting +1/0/-1 on it). OpenStack project teams have a policy requiring two positive reviews from core reviewers. A vote of +2 is allowed from core reviewers, and should be used to indicate that they are a core reviewer and are leaving a vote that should be counted as such. When a review has two +2 reviews and one of the core team believes it is ready to be merged, he or she should leave a +1 vote in the “Approved” category. You may do so by clicking the “Review” button again, with or without changing your code review vote and optionally leaving a comment. When a +1 Approved review is received, Zuul will run tests on the change, and if they pass, it will be merged. A green checkmark indicates that the review has met the requirement for that category. Under “Code-Review”, only one +2 gets the green check. For more details on reviews in Gerrit, check the Gerrit documentation. When a new patchset is uploaded to Gerrit, that project’s “check” tests are run on the patchset by Zuul. Once completed the test results are reported to Gerrit by Zuul in the form of a Verified: +/-1 vote. After code reviews have been completed and a change receives an Approved: +1 vote that project’s “gate” tests are run on the change by Zuul. Zuul reports the results of these tests back to Gerrit in the form of a Verified: +/-2 vote. Code merging will only occur after the gate tests have passed successfully and received a Verified: +2. You can view the state of tests currently being run on the Zuul Status page. Zuul leaves a comment in the review with links to the log files for the test run. Follow those links and examine the output from the test. It will include a console log, and in the case of unit tests, HTML output from the test runner, or in the case of a devstack-gate test, it may contain quite a large number of system logs. Examine the console log or other relevant log files to determine the cause of the error. If it is related to your change, you should fix the problem and upload a new patchset. Do not use “recheck”. If a job fails in the automated testing system with the status of POST_FAILURE rather than a normal FAILURE, it could either be that your tests resulted with the system under test losing network connectivity or an issue with the automated testing system. If you are seeing repeated POST_FAILURE reports with no indication of problems in the CI system, make sure that your tests are not impacting the network of the system. Identify which project or projects are affected, and search for a related bug on Launchpad. You can search for bugs affecting all OpenStack Projects here: https://bugs.launchpad.net/openstack/ If you do not find an existing bug, file a new one (be sure to include the error message and a link to the logs for the failure). If the problem is due to an infrastructure problem (such as Zuul or Gerrit), file (or search for) the bug against the openstack-gate project. It may also happen that the CI infrastructure somehow cannot finish a job and restarts it. If this happens several times, the job is marked as failed with a message of RETRY_LIMIT. Usually this means that network connectivity for the job was lost and the change itself causes the job node to become unreachable consistently. To re-run check or gate jobs, leave a comment on the review with the form “recheck”. If a nice message from Elastic Recheck didn’t show up in your change when a test in a gate job failed, and you’ve identified a bug to recheck against, you can help out by writing an elastic-recheck query for the bug. A patchset has to be approved to run tests in the gate pipeline. If the patchset has failed in the gate pipeline (it will have been approved to get into the gate pipeline) a recheck will first run the check jobs and if those pass, it will again run the gate jobs. There is no way to only run the gate jobs, the check jobs will first be run again. After patches land, jobs can be run in the post queue. Finding build logs for these jobs works a bit differently to the results of the pre-merge check and gate queues. For jobs in the post queue, logs are found at http://logs.openstack.org/<first two characters of commit SHA>/<commit SHA>. For example, if a change is committed with the SHA ‘deadbeef123456’, the logs will be found at http://logs.openstack.org/de/deadbeef123456. In many cases (particularly for higher-churn projects) the commit will be accompanied by a merge commit to stitch it into the branch and it’s that merge commit which is the subject of post pipeline jobs. In that situation you will need to review the Git log and use the SHA of that merge commit instead. The code should comply with everything in that project’s HACKING.rst file, if it has one. If the project reuses nova’s hacking guidelines, then it may have a “hacking” section in its tox.ini file in which case much of this is already checked automatically for you by the continuous integration system. The code should be ‘pythonic’ and look like the code around it, to make the code more uniform and easier to read. Learn the best practices for git commit messages. Use the “DocImpact” tag on changes that affect documentation. Use the “SecurityImpact” tag on changes that should get the attention of the OpenStack Security Group (OSSG) for additional review. Use the “UpgradeImpact” tag on changes which require configuration changes to be mentioned in the release notes. Use the “APIImpact” tag on changes impacting API stability, this tag will aid in gaining the attention of the OpenStack API Working Group for additional review. If the change fixes a bug, it should include the bug number. For example, add the line “Closes-Bug: 1234”. New test cases should be implemented using Mock. It is part of the Python standard library in Python 3 and as such is the preferred method for OpenStack. Exceptions can be made for tests added where Mox was already in use, or any other situation where using Mock would cause excessive difficulty for some reason. However, note that using mox does not support python 3 and mox3 has known to intermittently fail in py34 jobs, so it should be avoided if python 3 compatibility is a goal of the project being tested. There is no need to convert existing Mox test cases to Mock, but if you are changing a Mox test case anyway, please consider converting it to Mock at the same time. It is preferred for new code to use package six. When it is possible we should be use six.text_type or six.text_binary to cast or test value for unicode or str. Use of six.iteritems without clear justification should be avoided. If a dict will be very large, and the program will be expected to keep many such objects resident, then that should be stated in comments whenever six.iteritems is used. Otherwise, migrate the code to use .items() . Unit tests should be written in mock which supports python 3. mox does not support python 3 and mox3 is a limited port which intermittently fails in py34 jobs due to races. The code should comply with the community logging standards. Review is a conversation that works best when it flows back and forth. Submitters need to be responsive to questions asked in comments, even if the score is +0 from the reviewer. Likewise, reviewers should not use a negative score to elicit a response if they are not sure the patch should be changed before merging. For example, if there is a patch submitted which a reviewer cannot fully understand because there are changes that aren’t documented in the commit message or code documentation, this is a good time to issue a negative score. Patches need to be clear in their commit message and documentation. As a counter-example, a patch which is making use of a new library, which the reviewer has never used before, should not elicit a negative score from the reviewer with a question like “Is this library using standard python sockets for communication?” That is a question the reviewer can answer themselves, and which should not hold up the review process while the submitter explains things. Either the author or a reviewer should try to add a review comment answering such questions, unless they indicate a need to better extend the commit message, code comments, docstrings or accompanying documentation files. In almost all cases, a negative review should be accompanied by clear instructions for the submitter how they might fix the patch. There may be more specific items to be aware of inside the projects’ documentation for contributors. Contributors may notice a review that has several +1’s from other reviewers, passes the functional tests, etc. but the code still has not been merged. As only core contributors can approve code for merging, you can help things along by getting a core reviewer’s attention in IRC (never on the mailing lists) and letting them know there is a changeset with lots of positive reviews and needs final approval. To get early feedback on a change which is not fully finished yet, you can submit a change to Gerrit and mark it as “Work in Progress” (WIP). The OpenStack Gerrit system does not support drafts, use “Work in Progress” instead. To do so, after submitting a change to Gerrit in usual way (git review), You should go to Gerrit, and do Code Review of your own change while setting “Workflow” vote to “-1”, which marks the change as WIP. This allows others to review the change, while at the same time blocking it from being merged, as you already plan to continue working on it. After uploading a new patchset, this -1 (WIP) vote disappears. So if you still plan to do additional changes, do not forget to set Workflow to -1 on the new patchset. Once a change has been approved and passed the gate jobs, Gerrit automatically merges the latest patchset. Each patchset gets merged to the head of the branch before testing it. If Gerrit cannot merge a patchset, it will give a -1 review and add a comment notifying of merge failure. Each time a change merges, the “merge-check” pipeline verifies that all open changes on the same project are still mergeable. If any job is not mergeable, Zuul will give a -1 review and add a comment notifying of merge failure. After a change is merged, project-specific post jobs are run. Most often the post jobs publish documentation, run coverage, or send strings to the translation server. Project gating refers to the process of running regression tests before a developer’s patchset is merged. The intent of running regression tests is to validate that new changes submitted against the source code repository will not introduce new bugs. Gating prevents regressions by ensuring that a series of tests pass successfully before allowing a patchset to be merged into the mainline of development. The system used for gating is Zuul, which listens to the Gerrit event stream and is configured with YAML files to define a series of tests to be run in response to an event. The jobs in the gate queue are executed once a core reviewer approves a change (using a +1 Workflow vote) and a verified +1 vote exist. When approving, at least one +2 Code-Review vote needs to exist (can be given by core reviewer when approving). The convention is that two +2 Code-Reviews are needed for approving. Once all of the jobs report success on an approved patchset in the configured gate pipeline, then Gerrit will merge the code into trunk. Besides running the gate tests, the gate pipeline determines the order of changes to merge across multiple projects. The changes are tested and merged in this order, so that for each change the state of all other repositories can be identified.